Firstly, our thanks to Kelvin MacKenzie for coining the phrase on which we have based the title for this article. Difficult times are ahead for the European Union and in particular the Eurozone countries. 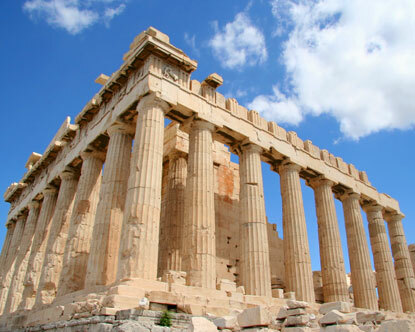 The present financial crisis in Greece has been a long time in coming. Essentially it started in 2001 when Greece joined the Eurozone. It should of course never have been allowed to do so. Greece joined on the basis of false and fraudulent accounts. Since that time, successive Greek governments – some of the most corrupt in the EU have borrowed and borrowed leaving Greece with a frightening sovereign debt, currently 112% of GDP, rising to 135% of GDP next year. This continued in a modified form with these bankers lending against the collateral of future Greek revenues, such as airport taxes and lottery earnings, which the Greek government signed away. None of this recorded as borrowings, thus allowing Greece to amass a sovereign debt that is one of the world’s largest relative to gross domestic product. Eurozone finance ministers, led by Germany have demanded that Greece cuts spending. Drastically. The Greeks have to pay a €20 billion instalment on its debt by May 2010. This money will have to be found. The consequences of a Greek default are very serious as it would bring about a new run on the banks. This would start in Wall Street but would spread quickly across the Atlantic and Eurozone and British banks would be affected. This is why Santander is planning on splitting into separate Eurozone and Sterling banks. A Greek default is however an unlikely prospect. What is very likely is that the other Eurozone countries will step in and bail the Greeks out. Germany will be the largest contributor but will, understandably demand that the other Eurozone members pay their share. Chancellor Frau Doctor Merkel will not be prepared to let the German taxpayer bear all the pain. It is also likely that the British government will be required to put its hand too into the pockets of the long suffering British taxpayer. This has to happen before May 2010. Reader of the British Gazette will of course be aware that there has to be a general election by early June. It is clear that Gordon Brown and Alistair Darling will be paying very close attention indeed to this Eurozone crisis. Clearly Brown will not want to go to the country having written a large cheque to bail out the Greeks! Expect no mention to be made of this arrangement, Brown is likely to go to the country before this is announced. The British Gazette makes this suggestion to Gordon Brown: if his fellow EU heads of government demand that the British Taxpayers must put their hands in their pockets to bail out the Greeks, then he MUST demand from the Greek government, to fully and irrevocably relinquish any and all claims to the Elgin marbles and that the Greek government must publically and formerly announce that it recognises that the Elgin marbles are the property of the British people in perpetuity. The political fallout for the European Union of this crisis is bad. Greece, already a vassal state of the EU following the ratification of the Lisbon Treaty will further see her sovereign autonomy stripped away from her. The fierce austerity programme that will be imposed upon Greece with all the savage and painful political effects will provoke huge anger amongst the Greek people. Expect to see street protests and riots later this year. It is going to be a long, hot summer in Athens. This of course will mean that the E.U. will become extremely unpopular in Greece! This of course means that anti-EU politicians will more likely be elected to sit in the EU parliament than otherwise.